Save time, money & aggravation by using our easy-to-use Bootstrap themes for your next project or start-up idea. Don't change your workflow! 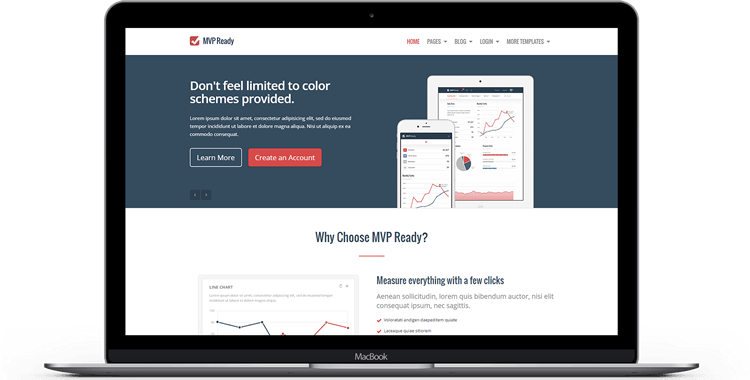 MVP Ready was crafted to seemlessly fit into your brand new or existing web development project. 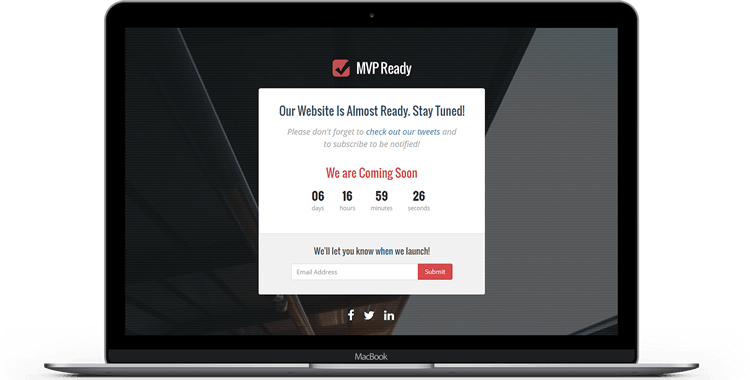 MVP Ready comes stocked with the basic essentials needed to significantly cut the development time of your next project. Use our ready made pages and customized components to jumpstart your project. MVP Ready was designed to work on a myriad of different screen sizes. Whether mobile, tablet or desktop interface; MVP Ready was crafted to perform spectacularly. When you purchase a license for MVP Ready you will receive access to all 4 templates featured below. Check out the demos to explore the amazing opportunities. A professionally crafted admin template, it's a fully responsive with a top navigation pattern. An effortless landing page template to display your next big project or service. 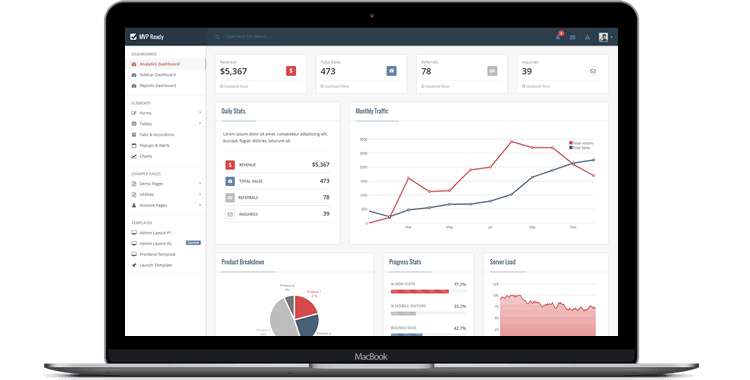 A professionally crafted admin template, it's a fully responsive with a side navigation pattern. Why wait to attract users? Keep your users informed and collect email addresses during development. MVP Ready is equipped to handle a wide range of browsers, including the latest modern browsers, and major mobile browsers. 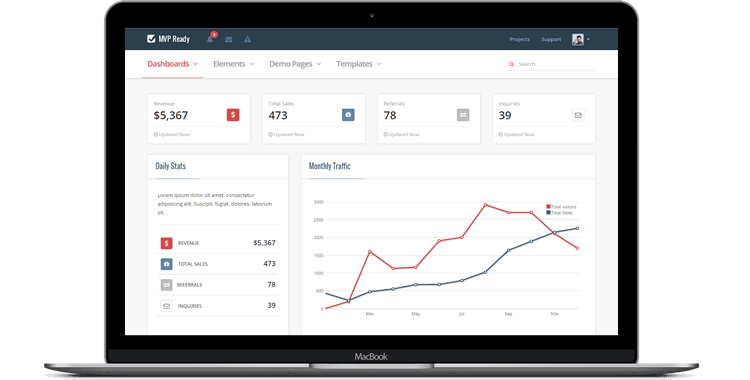 Our themes comes with 3 unique dashboard layouts: Analytics Dashboard, Reports Dashboard, and Sidebar Dashboard. Get a wide range of charting examples including donuts, lines, areas, pies, auto-updating, and stacked charts. Mask your standard form controls with dynamic, flexible jQuery plugins for select elements, checkboxes and date/time picker widgets. Keep your users up-to-date and in the know with an easy to use Facebook-like app notification center. Ready to use login, signup, forgot password, social login and profile pages for your application. 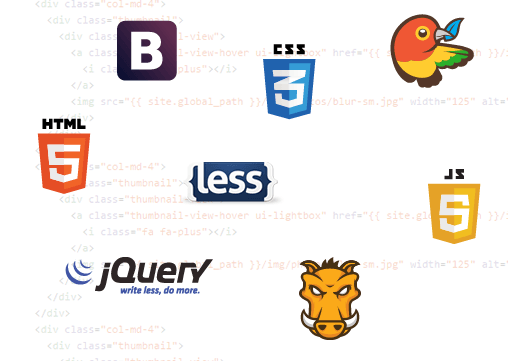 479 scalable vector icons that can be customized via CSS - size, color, drop shadow, anything. No need to worry about subscription or renewal fees. 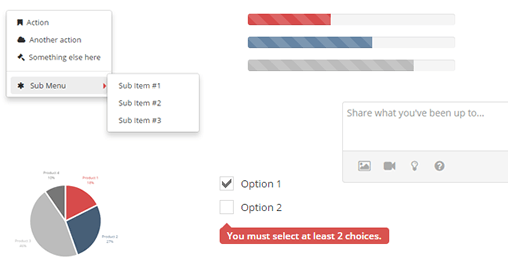 Once you buy a theme, you receive upgrades at no cost. Check out a complete listing of all the features and components included in this theme. Use this template for a single project/installation of your application. Use this template for multiple projects/installations of your application. Use this template for a project that you plan to sublicense, redistribute, or resell.